The complete color change is a process of 15 to 20 minutes at 121/250 H in a gravity cycle and 6 minutes in both a 132/270H gravity and vacuum-assisted cycle. When completely processed the colour changes from white to dark black. This steam indicator tape is used to secure the packs that have been wrapped with woven, non-woven, treated woven, paper and paper/plastic wraps. After the sterilization process is complete, the tape can easily be removed and cleaned, with no adhesive residue. Steam indicator tapes generally find application for immediate identification of the processed items while they also secure sterilization packs. Color change indicators are used to verify the exposure to the sterilization process. These steam indicator tape, sterilization indicator tape are individually packaged in 55 meters length roll and can also be availed in 25mm and 19 mm width. EO Gas Indicator Tape (Ethylene Oxide Indicator Tapes) are used for sterilization and consists of pink stripes and pressure-sensitive adhesive. The chemical strips convert from pink to green after they are exposed to the EO sterilization process. This indicator tape secures the packs wrapped with paper, paper/plastic and tyvek/plastic, non-woven, woven, treated woven, wraps and are used to distinguish processed and unprocessed packs. Indicator tapes find application for exposure control monitoring and assures that operator handling of the processed items that have been exposed to the sterilization process without the requirement of opening the pack or check load control records. What’s the application of insulation? Our insulation products are widely used on roofing, external wall, floor, HVAC pipe, transportation and any other places needing insulation. Vacuum insulated panels, or VIPs, are a relatively new product making their way into buildings in the United States. They can be used as stud cavity insulation or as continuous exterior insulation on structures, just like other types of insulation. As the name describes, VIPs consist of a panel with the air inside of it removed to form a vacuum. It isn’t a perfect vacuum, but the air pressure inside the VIP is considerably less than ambient pressure. 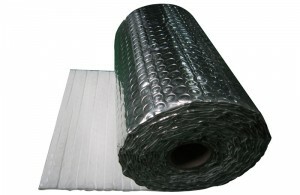 The panels are airtight and resistant to water vapor absorption. They make good insulators because the lack of air almost completely eliminates conductive and convective heat transfer through the center of the panels. Typical panels are fairly small, 1 x 2 feet or 2 x 4 feet, and about 1 inch thick. VIPs have an R-value of approximately R-25 per inch at the center of the panel and about R-20 for the whole panel (exact R-value depends on the manufacturing process and materials). The center of the panel will have a higher R-value than the edges, much like a window, as edges provide a thermal bridge for conductive heat transfer and lower the R-value of the entire panel. Even the whole-panel R-value is considerably higher than other insulations: fiberglass batts are around R-3.8 per inch, EPS is around R-4 per inch, and XPS is around R-5 per inch. VIPs are installed on the sheathing plane of a building using adhesive. The material surrounding the VIPs in a wall is very important, because it helps protect the VIP from damage during installation. However, because the VIP is not continuous, the lower R-value surrounding insulation will bring the total wall R-value down. This is similar to what happens in a traditional stud-framed wall with fiberglass batts in the cavities — the wooden studs provide a thermal bridge for heat to escape and reduce the total wall R-value. With VIPs, even if the “studs” were made of EPS insulation, the whole wall R-value will still drop more than the fiberglass wall drops with the addition of wooden studs. It is important to consider how to provide structure for VIPs without providing too much thermal bridging. As with any new building product, there are potential disadvantages of using VIPs that must be considered. First, VIPs must be manufactured in a factory and then shipped to the building site. They can’t be cut or modified in the field. This means that detailed plans must be completed prior to construction and there is no flexibility in modifying them, unlike a traditional stick-framed wall. VIPs also cost quite a bit more than other types of insulation. In addition to the more intensive manufacturing process, the panels have to be shipped to the building location. There are currently only a few manufacturers in the United States, so this could be quite a long distance. Finally, panels will naturally lose some vacuum over time. When they do, the R-value drops substantially. Manufacturers currently estimate the lifespan of the vacuum at 25 to 50 years. The seals must be treated carefully during the shipping and installation process to protect the vacuum. And putting a nail through a VIP damages the R-value of the panel much more than with other types of insulation. Losing the panel vacuum due to a hole in the panel reduces the panel’s R-value by more than half, often bringing it down to around R-6 per inch. Non-Woven foil is used widely to make car cap to Reflective Sunshine & in Roof, floor, wall, pack food for heat retaining, medical & sanitary, industry & agriculture, construction & daily-used products such as the agricultural plant covers, roof waterproof material, disposable items for medical and industrial applications, liners for furniture, packing material, shopping bags, suit and garment cover, industrial protective coveralls, garment accessory materials, bed articles, medical and sanitary articles as well as family and hotel consume articles, especially for heat insulation, thermal insulation and construction and other fields. What is “Aluminum foil composite film”? Aluminum foil composite film is the most commonly used composite film,it’s usually contain pure aluminum and aluminum. It has the good mechanical strength,light weight,no thermal bonding,with a metallic luster,good shading,it also has a strong ability to light reflection,not easy to be corroded,waterproof,strong air tightness,and retention of aroma. It’s used for pharmaceutical packaging,food packaging,barrier packaging,electromagnetic shielding packaging,etc.Do you like eat seaweed?Do you know what is the seaweed packaging material?That’s right,It’s made of aluminum foil composite film,besides,all the light, non barrier packaging cooking is composed of aluminum foil composite film. Used as the export equipment packing materials for moisture barrier, water-proof, fire-retarding and anti-corrosion. Processed to all kinds of fire-retarding products such as fire-proof packet, fire-proof suit, fire-proof bag, and fire-proof gloves etc. Used as the thermal insulation material on Roof,wall,floor,tank,vessel,air conditioner,tank,heat supply pipes or construction materials for the purpose of fire-retarding, anti-corrosion, heat protection and sound aborption. Packing chemical equipments such as oil and steam transportation pipeline. Vacuum packing is a method of packaging that removes air from the package prior to sealing. This method involves (manually or automatically) placing items in a plastic film package, removing air from inside, and sealing the package. Shrink film is sometimes used to have a tight fit to the contents. The intent of vacuum packing is usually to remove oxygen from the container to extend the shelf life of foods and, with flexible package forms, to reduce the volume of the contents and package. Vacuum packing greatly reduces the bulk of non-food items. For example, clothing and bedding can be stored in bags evacuated with a domestic vacuum cleaner or a dedicated vacuum sealer. This technique is sometimes used to compact household waste, for example where a charge is made for each full bag collected. Vacuum packaging products, using plastic bags, canisters, bottles, or mason jars, are available for home use. For delicate food items which might be crushed by the vacuum packing process (such as potato chips), an alternative is to replace the interior gas with nitrogen. This has the same effect of inhibiting deterioration due to the removal of oxygen. Good mechanical properties, 3-5 tims impact strength other films, endurable in folding . Good endurance with oil,fat,olefine acid and most of the solvents. Good endurance with extreme temperature. usable in long term in 120℃,in short terms, workable in 150℃ ,down to -70℃,very little effect on the mechanical properties. Low gas and vapor permeability, good barrier properties on water,oil and smell improving the shelf life . High clear film, UV absorption ,high glossy film. no poison , no smell ,good heath safety property, used in food packaging directly.